I graduated from University of Maryland many, many years ago. Heck, my son graduated from there years ago! Sadly, there were never great restaurant options when I was a student. If we wanted a nice meal, we went to the nearby Ledo’s Pizza. By the time my son attended UMD, the dining situation hadn’t progressed all that much. So on a rainy Saturday evening, when my husband announces he wants to go to Northwest Chinese Food in College Park, my first response is to raise my eyebrows. My skepticism evaporates as soon as he directs my attention to an article by Tim Carman in his $20 Diner column for The Washington Post. I grab my coat and we’re off to the town of my alma mater to explore the cuisine of the Northwest province of Shaanxi. We are handed a plastic coated menu, and instructed to fill in our order with an erasable marker. A server comes to retrieve it, gazing at me blankly when I ask her opinion on whether we’ve selected enough food. I’m used to going with my gut in these matters, so its not a big deal. 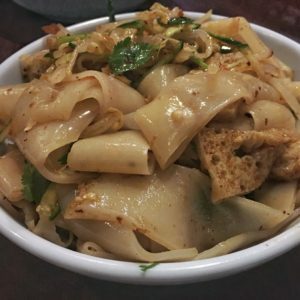 We hurriedly fill in the boxes with our selections: liang pi cold skin noodles, black vinegar peanuts, spicy cumin lamb burger, and hot oil-seared noodles with bean curd, tomato and eggs. Our order includes many of the dishes highlighted in the Washington Post. The flavors are strong with an emphasis on salt, garlic, onion, and vinegar. Many of the dishes at Northwest Chinese Food include the word spicy in their descriptor. We’re happy to follow the heat. The spice-averse will probably want to focus on noodle dishes. 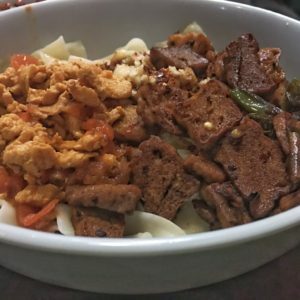 This isn’t an issue- there is a broad selection of both knife-cut noodles and rice noodles topped with beef, pork, potatoes, or eggplant. Liang pi cold skin noodles, made in-house, are clear and slippery, doused with chili oil and black vinegar. The noodles are appropriately chewy, and the flavor is a wake-up call. After just a few bites, it’s clear that this is not your average neighborhood Chinese restaurant. Spicy Cumin lamb burger isn’t a burger at all. Instead, it’s slivers of lamb tucked inside a well-toasted bun. Both the chili and the cumin are accents to the meat rather than a predominant presence. 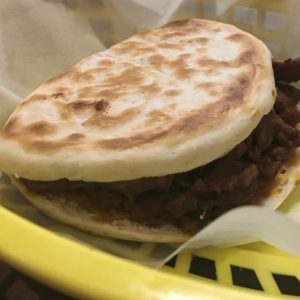 The chili oil slithers out of the bun, but if you’re careful about where it lands, this only adds to the enjoyment. Hot-oil seared noodles can be enhanced with tomato and eggs and bean curd. The additions are must-haves for vegetarians. As a carnivore, I’m happy to take a break from meat with this powerhouse dish. Black vinegar peanuts do not really speak to me, but this is highlighted in the $20 Diner review, so I agree to give it the old college try. More oil, more chili, more intense heat and flavor. I like it, but find that a few peanuts go a long way. While the food is first-rate, the restaurant also makes the grade for its bargain prices. We spend $30 on dinner for two. 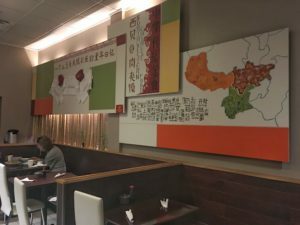 Northwest Chinese Food is a bright light in College Park, a town that once upon a time was woefully academic when it comes to dining.